In honor of St. Patrick’s Day, the Metal Construction Association (MCA) has decided to celebrate our favorite metal green buildings; figuratively and literally. MCA—and its members—embrace the green construction movement, and support sustainable and energy-efficient products. Here is a list of some green projects we hope you will find interesting and inspiring. Billed as the greenest, most energy efficient commercial building in the world, The Bullitt Center is a net zero energy building that is being constructed to meet the goals of the Living Building Challenge. Scheduled to open in 2013, the building features metal panels from Metal Sales Manufacturing Corporation that have a long life span, are 100% recyclable and contain a high percentage of recycled material. Coined “the office of the future”, the Pixel Building is the first carbon neutral office building in Australia, and has received the highest Green Star rating ever awarded by the Green Building Council of Australia. With striking, multi-colored metal MCM panels from Alpolic on the exterior, the building is sure to grab the attention of passersby. No, this Department of Defense facility is not olive drab, but the project earned a place on this list because its recent metal-roof retrofit includes integrated renewable energy technologies that will maximize electricity generation. The roof also has a rainwater capture system that will be used for irrigation purposes on the base. The MRA Scanner Unit project features Insulated Metal Panels (IMPs) from Kingspan Benchmark in various shades of green. It’s on this list because we love the colors for St. Patrick’s Day, but it’s not just an attractive project. In fact, IMPs provide consistent insulation and thermal efficiency, often leading to increased energy efficiency. 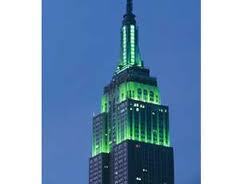 A true American icon, the Empire State Building is bathed in green lights for St. Patrick’s Day. In 2012 the building was outfitted with a new, energy-efficient LED lighting system that will make this year’s St. Patrick’s celebration even more green. Find out when you can view tower’s lights with their schedule. MCA wishes you a very happy St. Patrick’s Day!